When this common scavenger finds a victim that is on the brink of death, it will finish it off with a neurotoxic venom in its talons, and then flap its wings to contaminate the meat with poison so that only its own kind can eat it. Despite its reputation as a spectre of death, this Kreature is playful and clever. It can distinguish one person from another, responding positively to those who treat it kindly, and holding a grudge against those who betray its trust. Its fast learning curve, ease of care and useful support abilities make it a popular choice among newbie Kreature Tamers. More than likely, this would be my starting kreature. Simple and stylish. 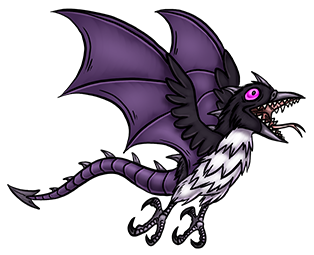 A simple combination of avian and draconic features make the Dracrow here a solid monster. Loving the venomous talons it has as well.